Press Conference by Engr. A. A Sule Gubernatorial Campaign Organization in response to wrongful accusation of His Excellency Alh. Umar Tanko- Almakura of grand plot to impose Engr. A. A Sule as the preferred gubernatorial candidate on the good people of Nasarawa State. The attention of Engr. A. A Sule Gubernatorial Campaign Organization has been drawn to an unfair, biased, baseless and inaccurate allegation reported in Sunday Sun Newspaper of September 23, 2018 page 40 with the caption, “APC Guber Aspirants in Nasarawa threaten to dump Party over allegation of imposition”. We wish to categorically state that the publication credited to some gubernatorial Aspirants in APC in Nasarawa State is completely done in bad faith, and with malicious intention to deliberately malign the integrity of the incumbent Governor, His Excellency, Alh. Umar Tanko Almakura and drag the entire APC Leadership in our State into disrepute. Ordinarily, response to unsubstantiated allegation of this nature wouldn’t have been necessary, but that the accusers expressed their perceived grievance through the media without proper checks through inexhaustible democratic channels within the Party call for worries. This weighty and baseless allegation is an attempt to cause disintegration of our great Party and is aimed at breeding bad blood and discontentment in the rank and file of the Governorship Aspirants in the state. If not checked, such act is capable of casting aspersion on the resolve of His Excellency, Alh. Umar Tanko-Almakura and the efforts of the APC leadership to conduct transparent, free, fair and credible gubernatorial and other primaries in the state. The connection of our gubernatorial aspirant to this allegation is a clear indication of a grand plot to distract our Campaign activities and halt the soaring public support, ovation and acceptance that the aspiration of Engr. A.A Sule is enjoying from preponderant majority of the people in the State. Therefore, as we approach the Governorship primaries, it has now become expedient to address the unwarranted and unsubstantiated allegation threatening the integrity of the personality of our dear gubernatorial Aspirant and hostile to his desire to serve the good people of the state at this promising time. To assert such weighty and baseless allegation loaded with bias and inaccuracies against His Excellency, Alh. Umar Tanko-Almakura with a view to scoring cheap political points or sympathy is rather unfortunate. Not even at this time that our state is complementing Federal government’s efforts to rid our society of fake news and avoid its damaging consequences to our body polity and peaceful coexistence. Today, President Muhammadu Buhari GCFR is strongly advocating that internal Party Democracy be upheld at all times and that our Great Party, the APC should do everything possible to avoid any form of imposition against the wish of the people. This is because Mr. President is fully aware that key ingredient to sustain internal democracy is the avoidance of imposition of candidates on the party at any level. Therefore, every aspirant interested in an elective office should be given the opportunity to test his popularity within the Party’s framework of functional internal Democracy in a free and fair process. Anything short of this is a total detour from democratic norms and principles which our great Party of progressive minds stands for. While the accusers of His Excellency, Alh. Umar Tanko-Almakura have the right to their opinion and the right to vent their anger or perceived wrongdoing, insulting and embarrassing the Executive Governor and the architect of modern Nasarawa state, Alh. Umar Tanko-Almakura with malicious publication is unacceptable and we condemn the act in its entirety. 1. Our great Party (APC) under the leadership of His Excellency, Alh. Umar Tanko-Almakura is intact and without any rancor or misunderstanding of any form among the Party leaders as claimed. 2. That there is no such grand plan or plot as being speculated for execution to impose Engr. A.A Sule against the wishes of the people during the governorship primaries. As a grassroot politician, His Excellency, Alh. Umar Tanko-Almakura is fully aware of the danger inherent in such act and cannot afford to repeat mistakes of past leaders; either through open or undemocratic endorsement of any kind. 3. That those who have decamped from our Party to other Parties have done so to satisfy their personal political conviction, conscience and permutations thereby lacking the moral rights, values or justification to claim that lack of internal democracy is responsible for their action. 4. That our Gubernatorial Aspirant, Engr. A.A Sule has enough credentials and mass based support to speak for him without necessarily seeking to be an anointed or preferred candidate of the Governor. He has never for any reason claim such privilege where and when it does not even exist. 5. That His Excellency, Alh. 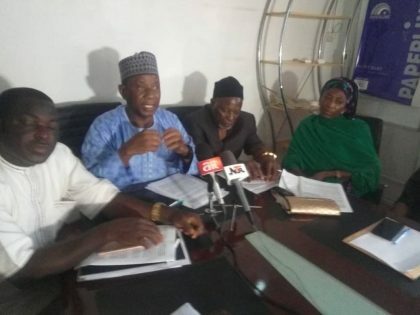 Umar Tanko-Almakura with the support of the Party Leadership has resolved to provide a level playing ground for all aspirants jostling to occupy the Nasarawa state Government House and other political offices on the bases of merit and popular acceptance by the people through a free, fair and credible Party Primaries. However, as seasoned and experienced politicians, we are not unmindful of the fact that the acceptance and soaring popularity of Engr. A.A Sule in the state gubernatorial contest may have, to some extent, changed the political permutations and expectations of many political opportunists who now resort to spreading false information and wrong accusation to target and assassinate some individuals’ characters on selfish ground. While this is harmful to the integrity of our Governorship Aspirant and the overall goal of our campaign organization, we will do everything necessary to resist unguided utterances that could hinder us from actualizing our goal of winning the Party gubernatorial Primaries and the elections in 2019. At this juncture, we wish to state that the personality worth of Engr. A. A Sule as the best man for the job is a clear reflection of his general endorsement by the people of Nasarawa state for many reasons. Firstly, his humble background, quality education and professional practice spanning over 35 years, during which he carved out a niche for himself as an uncommon administrator and manager has endeared him to the various publics within the Political Space of the State. This is responsible for the overwhelming support and loud ovation across the state that greeted his resolve to offer himself to serve his people. That Engr. A.A Sule is enjoying a successful career is not in doubt. His stint with Public service started at the Plateau electricity Corporation; Plateau Utilities Board where he did the mandatory NYSC service and the Jos Steel Rolling Company ltd. where he served meritoriously before returning to the USA to start work and to lay the foundation on which he has built a successful professional career. Over the years, he had managed several world class companies and corporations abroad and in Nigeria. Some of these are the Lancer Corporations, San Anthonio; OEM components, Houston; Morgan performance, Houston; Dril-Quip incorporated, Houston; Osyka corporation, Houston; Ulti-Care Lyka Pharmaceuticals, African Petroleum (AP) Oil field Services, etc. On returning to Nigeria after professional practice and successful career abroad, he served as Executive Director Sadiq Petroleum and later appointed as MD/CEO of a highly indebted African Petroleum plc (Forte Oil) Lagos and he was able to successfully turn the fortune of the company around to a corporate giant in the oil industry till today. He later voluntarily resigned from African Petroleum Plc to join an American Multi-national oil Service Company called Tetra International, where he served as Business Development Manager/Country Manager till 2006 when he ventured into partisan politics. As a professional, technocrat and Politician, he adopted “developmental approach to Politics” thereby making the people’s welfare the focus of his service to humanity. This approach has, today, yielded many dividends as demonstrated through building bridges, culverts, renovation of schools, clinics, houses of worship and security posts etc. for the benefit of the good people of Nasarawa State. It is on record that Engr. A.A Sule has selflessly used his personal resources to fund investment trips of prospective investors’ to Nasarawa state for business opportunities that can drive the economy of the state. Without any form of contradiction, one can boldly state that Engr. A.A Sule is ready for effective governance of our state haven structured out his clear vision and mission for the development of the state years ago when he tried to seek the Governorship ticket in 2007. His stable mentality and temperament, experience and firm belief in the modern Nasarawa state project as initiated by the incumbent Governor has remained a strong catalyst in his choice of distinguished personalities to serve, direct, administer and effectively run his mass based and well-structured Gubernatorial Campaign Organization with established presence throughout the entire state. It was therefore not surprising that he was completely endeared to the hearts of the people at all levels as practically demonstrated by overwhelming receptions and honour the people accorded him during the recently concluded campaign tour of the entire state in company of the distinguished personalities; men and women of capacity and proven integrity and reputation. For this reason, we are very optimistic and hopeful that Engr. A.A. Sule will eventually emerge as APC Party’s flag bearer in the forthcoming gubernatorial primaries going by the enormous work and commitment of the Gubernatorial Campaign team and other eminent personalities who have committed their time, experience, capacities and determined to ensure the emergence of Engr. A A. Sule as Governor of Nasarawa State. 1. Senator John Danboyi – Director General (from Akwanga LGA). 2. Sen. Abubakar Sodangi (3 term Senator) –Chairman, Advisory Council, from Nasarawa LGA. 3. Hon. Samuel A. Egya (3 term Member, House of Reps.) – Director of Mobilization, Research & strategic planning, from Nasarawa LGA. 4. Pharm. Victor Terah – Director of Publicity/Communication from Karu LGA. 6. Hon. Yusuf Aliyu Turaki (Fmr. Chairman, Awe Local Govt. Council) – Director of Operations from Awe LGA. 7. Hon. Halima A. Jabiru (Fmr. Special Adviser to the Governor) – Director, Women Affairs, from Lafia LGA. 8. Hon. Kwanta Yakubu (Fmr. Chairman, Akwanga Local Govt. Council) – Acting Director, Youth Mobilization from Akwanga LGA. 9. Hon. Murtala Lamus (Fmr. Chairman, Wamba LGC) – Member of the Campaign Org. from Wamba LGA. 10. Hon. Abdullahi Mustapha (Fmr. Commissioner) – Zonal Coordinator, Nasarawa Southern Zone -from Lafia LGA. 11. Hon. Lawee Yusuf (Fmr. Commissioner) – Member of the Campaign Org., from Akwanga LGA. 12. Hon. James Thomas (fmr. Chairman Karu LGC) – Member of the Advisory Council, from Karu LGA. 14. Hon. Barr. Adamu Maikatako (Fmr. Member, NSHA) from Lafia LGA. 15. Hon. Isa Onuku (Fmr. Member, NSHA) from Keana LGA. 16. Prince Atajiri – Zonal Coordinator, Nasarawa West-from Keffi LGA. 18. Others too numerous to mention. At this point, we wish to strongly appeal to all the stakeholders in our great Party (APC) who may feel slighted to consider the baseless allegation of imposition as figment of the accusers’ imagination. While it is not surprising to hear such unsubstantiated allegations as this at a time close to the Primaries elections, courtesy demand that, as loyal party members, such should be treated as mere idle talks of political opportunists willing to deceive the people and throw our Great Party in confusion just to provide unnecessary justification for their actions and exit from the Party. We also wish to stress that anyone who joins these political self-seekers either to peddle unsubstantiated allegations or decamp from our great party at this promising time does so at his or her own risk. As we prepare for the Primaries, we use this medium to call on everyone to be at alert and beware of the pranks of these questionable characters who may be representing the interest of the opposition going by their predetermined action and decision to embarrass our Party. We assure all our party leaders and our teaming supporters that Engr. A.A Sule Gubernatorial Campaign Organization will continue to maintain maximum cooperation and understanding with all aspirants and will avoid any act that may undermine this cordial relationship. We shall sustain our unflinching commitment to abide by the rules of the game. Also, our resolve to remain absolutely committed to the tenets of fairness, equity, justice and internal Democracy throughout the Gubernatorial and other Primaries remain unshakable, as nothing short of this can stimulate the needed cooperation to project our Party for victory in 2019. In conclusion, we use this opportunity to strongly appeal to all our teaming supporters to refrain from any action or issues that can undermine the efforts of His Excellency, the Executive Governor of the Alh. Umar Tanko-Almakura and all our Party leaders to implement the best APC Party Gubernatorial and other primaries in the Country. Our resolve and determination to help achieve this noble objective remain unshakeable.